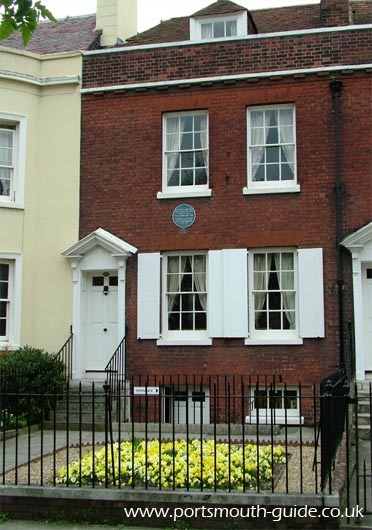 Charles Dickens was born in the house pictured above on 7th February 1812. John Dickens Charles' father was a clerk in the Navy Pay Office, he had brought his bride Elizabeth to Portsmouth in the summer of 1809 and this was their first marital home. The Dickens family stayed in Portsmouth until 1815 when John Dickens' job forced the family to move to London. Although Charles Dickens' time spent in Portsmouth was short he did return on three separate occasions, on one occasion he carried out research for his book Nicholas Nickleby. The museum was opened in 1904 and the furniture, ceramics, glass, household objects and decorations are re-creations of the type Charles's father would have used. There are three furnished rooms in the house the parlour, the dinning room, and the bedroom where Charles was born. In the kitchen is the painted dresser which has survived from Mrs Dickens' kitchen and is part of the structure of the house. There is a collection of memorabilia including the couch he died on in Kent, an inkwell and paper knife he used and much more. There are also regular readings from Charles Dickens' books in the summer months held in this house. The house where Charles Dickens was born was originally called No 1 Mile End Terrace which later became 393 Commercial Road when the road was absorbed into Commercial Road until the construction of the M275 which cut Commercial Road in two. The isolated part of the road became Old Commercial Road where Charles Dickens Birthplace can now be found. The Charles Dickens Birthplace Museum website can be found here.